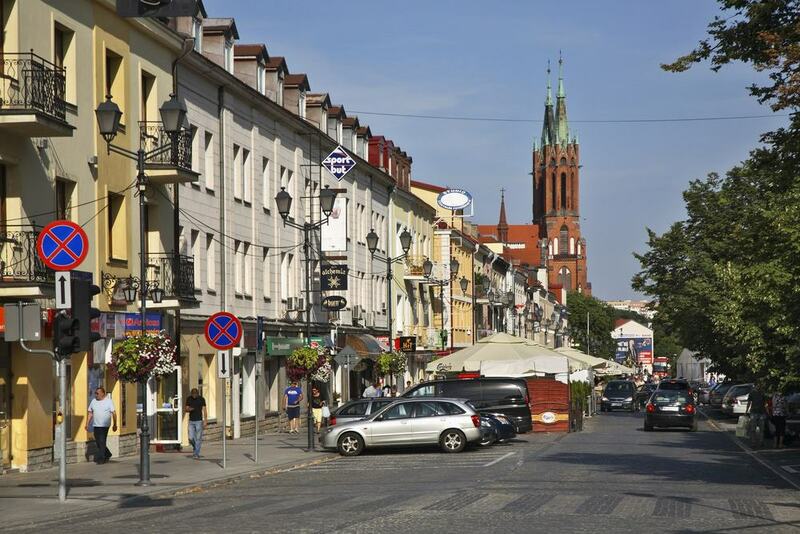 A city at the far eastern boundary of the European Union, Białystok is under 60 kilometres from the border with Belarus. The centre of this former textile city is compact and walkable, and was planned in the early 18th century by Jan Klemens Branicki. He was one of the richest men in Poland at the time and built himself a miniature Versailles with its own plush formal gardens. When industry arrived in the 19th century the city became a melting pot of minorities, inspiring Białystok’s most famous son, L. L. Zamenhof to develop Esperanto in the 1870s. 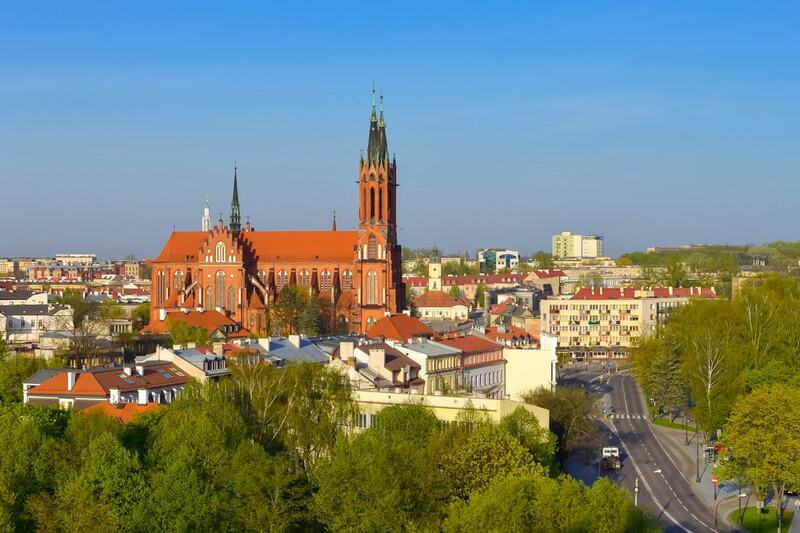 For some visitors, Białystok is a convenient jumping off point for the Białowieża National Park, which has Europe’s last tracts of primeval forest, and the world’s largest population of European bison. Jan Klemens Branicki, an affluent nobleman who had pretensions to the Polish crown was the man behind this 18th-century wonder. Not only did he build a palace and gardens, but extended his plans to create a Baroque city with churches and a town hall. The palace is the biggest surviving piece of his plans, and you enter the grounds in solemn fashion passing under the ceremonious Griffin Gate, named for the family coat of arms. The palace looks a lot like it did when it was completed in the early 18th century, as does the Great Hall, Chinese Room and the magnificent vestibule, all free to enter and shared by the Medical University. The gardens have also been kept from that time and so stand as the best example of Baroque garden design in Poland, with topiaries, geometric lawns, stone vases and fountains. 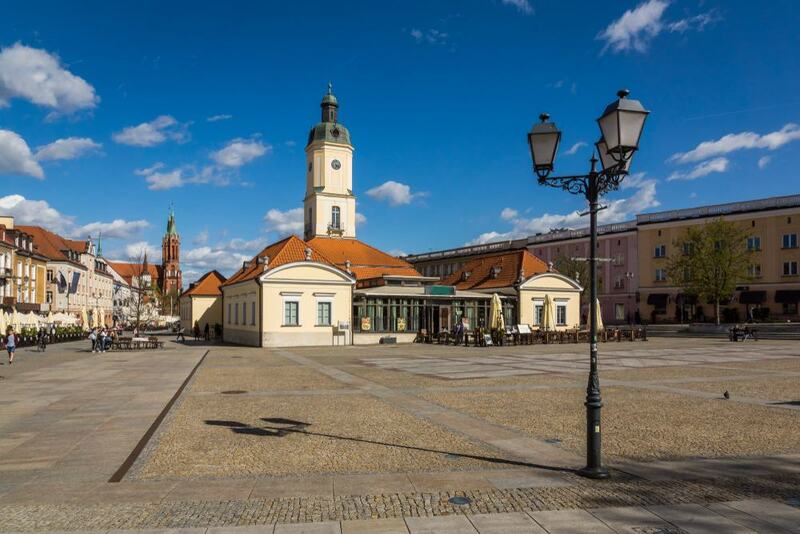 Plotted around the town hall, Białystok’s market square is in the shape of an elongated triangle. The original town hall was in Jan Klemens Branicki’s plan, and as the centre of commerce in the city was the site of the town’s official scales and weights and measures of length and volume. This has since been rebuilt after taking damage in the war and now houses the main building for the Podlachian Museum. The row of townhouses on the western side may well be the prettiest sight on the square, as the facades have ornate sgraffito decoration with foliate patterns, portraits, images of animals and mythological figures. In good weather you can plonk yoursel at a cafe or restaurant table, soak up the view east to the cathedral and see the city going about its day. One of the neat things about Białystok’s Cathedral is that when you stand outside you can see just how much the city grew in the 1800s. There are two interconnected buildings: The smaller whitewashed Mannerist church used to be the parish church was built at the start of the 17th century. This is dwarfed by the new Neo-Gothic church, which is 90 metres long and 75 metres high, and was built between 1900 and 1905 to accommodate a congregation that was now 12,000 strong. At the old church, look for the fine main altar, the Mannerist pulpit and the tombs for the Gryfit-Branicki family. The new church needs to be seen for its sheer magnitude and its lofty vaults, even if doesn’t have the history of its smaller neighbour. Białystok’s main artery begins at Kościuszko Market Square and continues west for 800 metres. Józef Piłsudski, Adolf Hitler and Josef Stalin have all had their names attached to Ulica Lipowa, before it returned to its original name (Lime Street) in the 1990s. More than any other street in the city, Ulica Lipowa bore the brunt of the German attack in the Second World War. But its high tenement houses and villas have been restored and there’s an array of interesting sights, like the Cristal Hotel, the first new hotel in Poland after the Second World War. 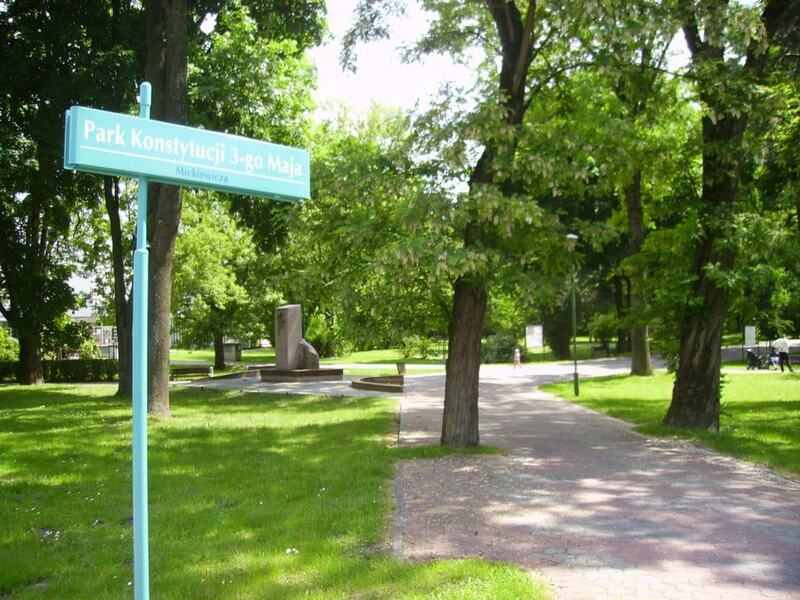 If you cut down Ulica Malmeda you’ll come to a statue of L. L. Zamenhof, the Białystok-born doctor who invented Esperanto. At the far end on Plac Niepodległości is the eye-catching Church of Christ the King, one of the world’s first Modernist churches when it was completed in 1946. 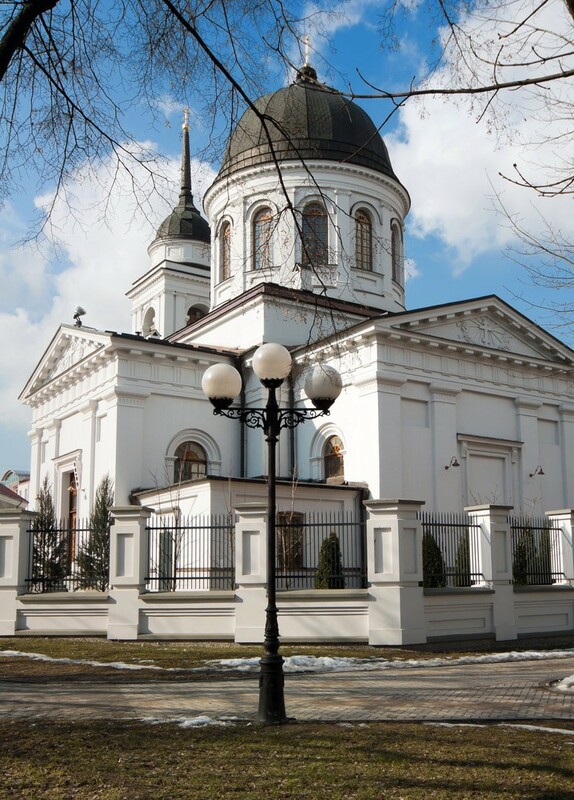 The cathedral for Białystok’s Orthodox congregation, the Church of St Nicholas on Ulica Lipowa, is also the official Orthodox church for the Polish Army. Dating to the 1840s and with Neoclassical architecture, it’s a rather small but beautifully formed monument. Go in for the colourfully patterned wall paintings, which borrow motifs from St Volodymyr’s Cathedral in Kiev. The frescoes are also exquisite, particularly on the dome, which has Christ Pantocrator, above Mary and John the Baptist and then 12 apostles, four evangelists and prophets. The iconostasis was composed in 1844 and among its icons are images of the evangelists and the Annunciation. This institution is scattered around Białystok and wider Podlachia, but is headquartered at the town hall on the city’s market square. Strictly speaking, the town hall isn’t really a town hall as it was never a government building, but rather a place to do business. When the predecessor of the current building was erected in 1745 there were already ten Jewish merchants trading here. The present town hall is from just after the war, and is a pared down version of the building that came before. Inside is the Gallery of Polish Painting, with a small but heavyweight assortment of art from the last 250 years by portrait painters like Marcello Bacciarelli, Johann Baptist von Lampi the Elder and Josef Grassi who travelled to Eastern Europe from Italy and Austria. A branch of the Podlachian Museum, this attraction was set up in sumptuous factory owner’s villa on Ulica Warszawska in 1990. And given the origins of the building, one of the main exhibitions shows off all the finery of a wealthy bourgeois home from the end of the 19th century. There’s a music salon, boudoir, study and dining room, decorated with period furniture, tableware, clothing, musical instruments and everyday objects from the time. Check out the scale models that show how Białystok looked in Branicki’s day, and reproductions of lost monuments like the famed Ritz Hotel . 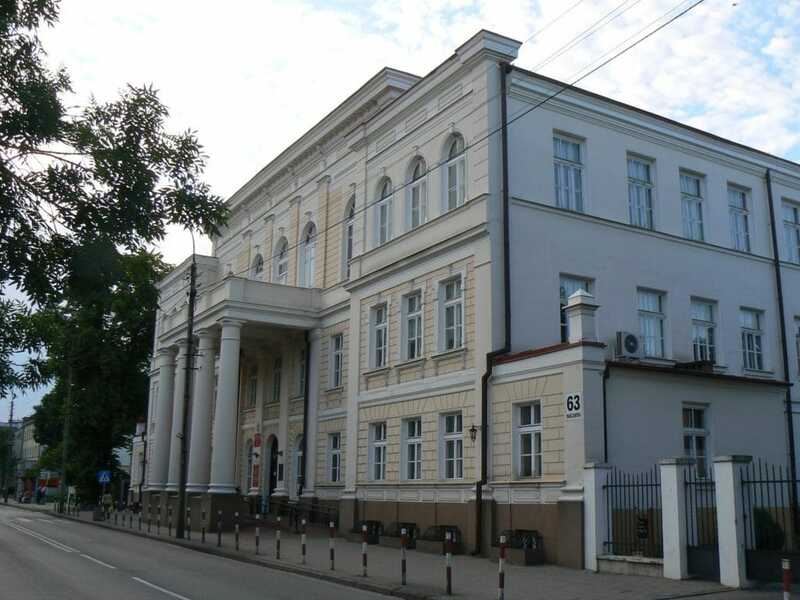 The museum also has a sizeable numismatic collection of 30,000 coins, medals and seals, as well as Poland’s only museum collections dedicated to the Tatars who settled on the Polish, Lithuanian and Belarusian border. An outdoor museum in the Swedish “Skansen” tradition, this attraction has 40 buildings and other cultural artefacts gathered from around the Podlachian Province. The museum was founded in 1982 and part of its job was to safeguard the traditional wooden building methods in this region of Poland. There are two windmills, a forge, a lumberjack’s hut, a Belarusian cottage, a wooden treadmill and a cave-house. Maybe the most accomplished projects were the relocation of a Neoclassical wooden manor house from the 1810s, and a whole hamlet with five homesteads around a central square. Most are open and have traditional furniture and pottery, along with tools from the time. For some low-key sightseeing you could take a walk along this street for just over a kilometre from Ulica Henryk Sienkiewicz to Ulica Piastowska. What sets Ulica Warszawska aside is its abundance of regal 19th century architecture, mostly for high-ranking government officials and factory owners. One such building is the pink-painted palace for Białystok’s governor during the brief period that the city was under Prussian rule at the turn of the 19th century. Later it became a school, and L. L. Zamenhof (inventor of Esperanto) studied here. 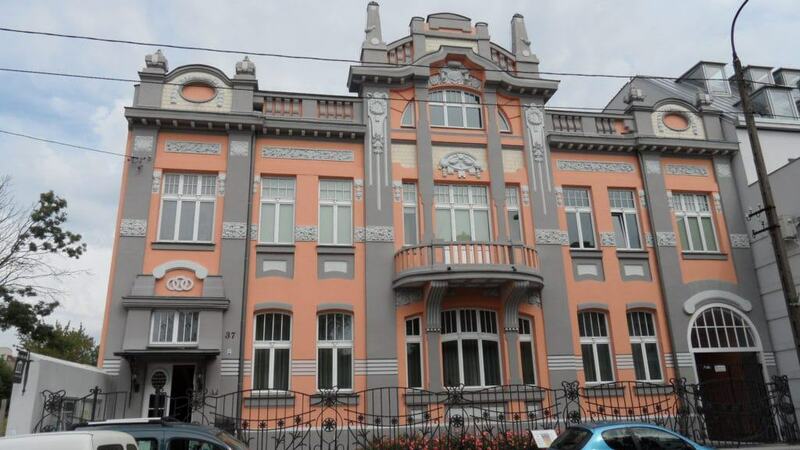 Both the Historical Museum and the neo-Baroque Trylling Palace, now the Rubin Hotel, at 7 Ulica Warszawska, were built by owners of textile factories (Citron and Trylling) at the turn of the 20th century. At Ulica Kilińskiego 7, the military museum fixes its gaze on the events of the 20th century, in particular the Second World War. 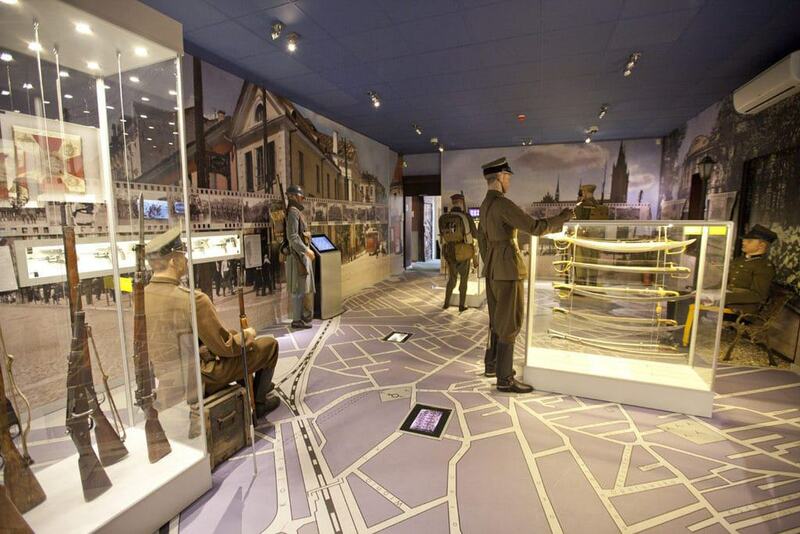 The exhibition is dominated by its well-researched dioramas depicting a resistance activities, a trench in the September campaign of 1939, a Bren gun assault at the Battle of Monte Cassino in 1945, the Eastern Front from 1944-1945 and the notorious Battle of Bautzen. In the post-war exhibits you can see how weapons, uniforms and equipment have changed since the 1950s, and find out about the peacekeeping and combat missions that the Polish Army has been engaged in over the last 25 years. 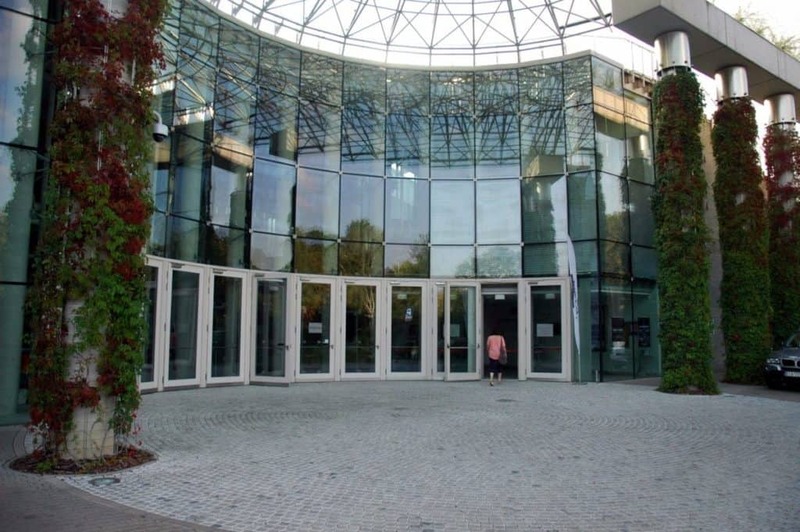 Northeastern Poland’s biggest and most modern cultural institution, the Podlachian Philharmonic and Opera moved into a brand new complex in 2012. This Minimalist concrete and glass construction opened in time for the highly-regarded opera’s 58th season and is worth a detour even if you’re not up for high-brow entertainment. The main stage, with a capacity of up to 1,000, is equipped with the second largest organ in Poland. This high-tech hall also has movable platforms in the ceiling, with glass screens that can help customise the hall’s acoustics according to the performance taking place. Also in the complex is an outdoor amphitheatre, and lush gardens integrating with the architecture and featuring a cast-iron sculpture by Teresa Murak, weighing 2.5 tons. On Ulica Surasaka you may be stopped in your tracks by a memorial on the site of Białystok’s former Great Synagogue. 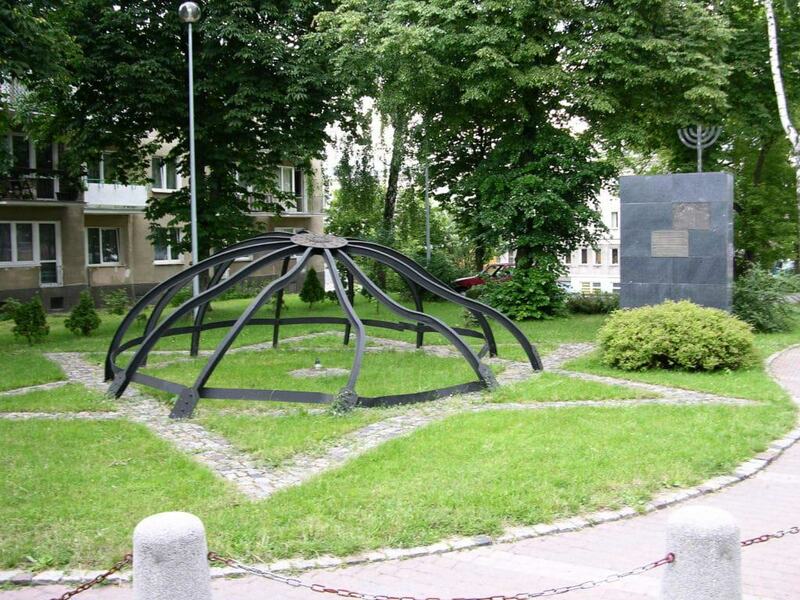 On a lawn is the crumpled metal frame of the synagogue’s dome in the middle of a paved Star of David. An outrage took place at this place on 27 June 1941, when a large number of Jews were locked into the Great Synagogue by Nazi troops who burnt the building down. An estimated 3,000 people were killed here and in other atrocities around Białystok in what is remembered as “Black Friday”. 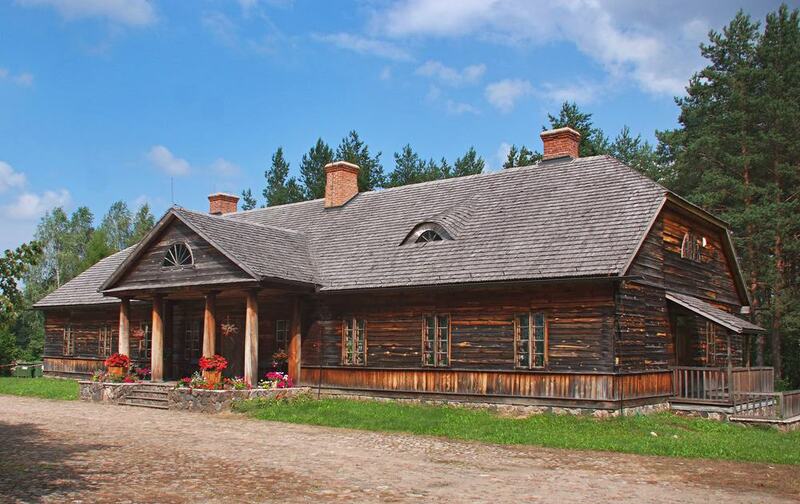 One of the finest properties in the centre of Białystok is the wooden villa built in the second half of the 19th century for the Major General Mikołaj Fiodorowicz. 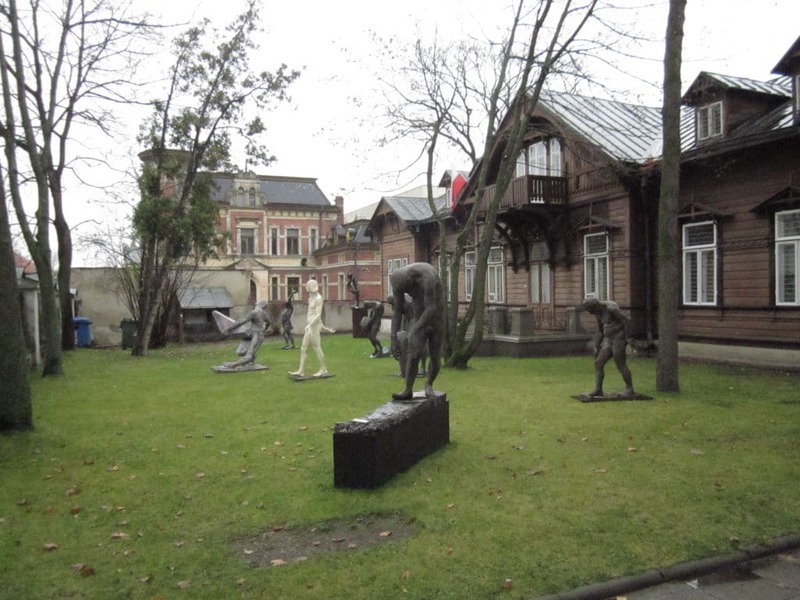 Since 1993 this has been a museum for the Białystok-born sculptor Alfons Karny. His career spanned most of the 20th century, producing monuments in the Socialist Realist style, but also likenesses of figures as diverse as Albert Einstein, Ernest Hemingway and Nicholas Copernicus. On display in the museum are Karny’s images of famous Poles from the 20th century, as well as tools from his workshop and his collection of historic and contemporary art. 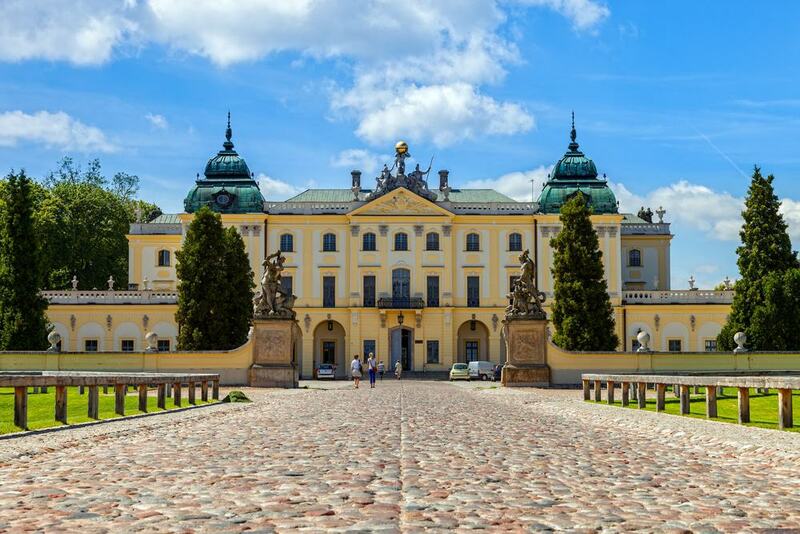 Children may have to be patient to get through Białystok’s cultural attractions, but they can look forward to a great little zoo a few hundred metres from the Branicki Palace. It was founded back in the 1960s, and while it used to have exotic species, the zoo’s emphasis is now on animals from eastern Poland. These are brown bears, grey wolves, fallow deer, red deer, wildcats, lynxes and bison, as well as regional breeds of horses, goats and ponies. The zoo also has an aviary for buzzards, tawny owls, Eurasian eagle owls, white storks and two pheasant species. You’ll be pleased to see that the habitats are large for the most part, and have a lot of foliage. 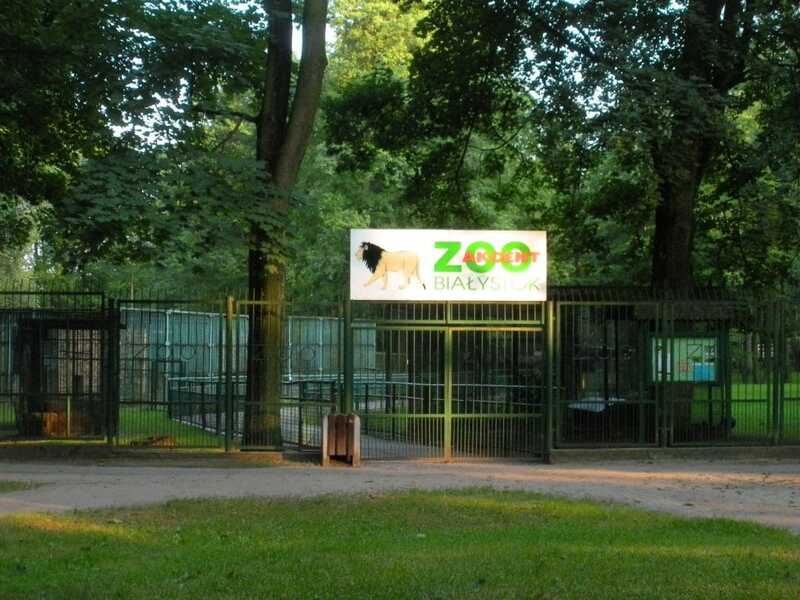 The zoo is just the northern tip of what used to be a big swathe of the Zwierzyniecki Forest, pushing out for miles to the south of the city and used by the Branicki family as a hunting ground. Now the park is about half the size, and 16 hectares, but remains refreshingly uncultivated. Most of the terrain is shrouded by dense mature forest of oak, hornbeam and birch, and with elms and alders growing in the more humid pockets of the park. Keep a look out for the Polish and Soviet military cemetery for the two World Wars, as well as the monument to the fallen soldiers of Poland’s 42nd Infantry Regiment in the conflicts that followed the First World War.